Usage notes: The French proverb impossible n’est pas français appears patriotic, as if to suggest that impossibility is not in the realm of a French person’s abilities – in other words, that for the French, anything is possible. In fact, français here is not describing the people, but rather the language: supposedly, impossible isn’t a French word, therefore nothing is impossible. 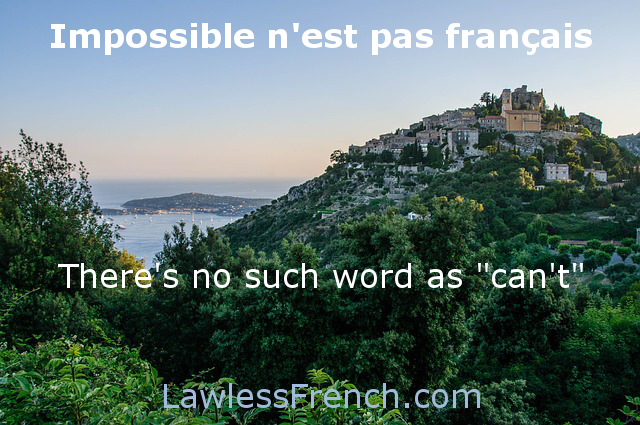 The best English equivalent is "there’s no such word as can’t" or "there’s no such thing as can’t," but you might want to translate more loosely with "nothing is impossible" or "never say die." Èze est un village perché sur un sommet impossible, mais impossible n’est pas français. 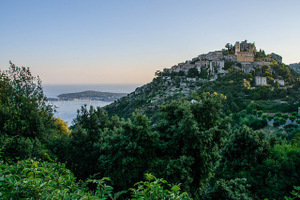 Èze is a village perched on an impossible peak, but nothing is impossible. – Je ne peux pas le faire, c’est impossible ! – Impossible n’est pas français. – I can’t do it, it’s impossible! À cœur vaillant, rien d’impossible. – Nothing is impossible to a willing heart.